Hand quilting thread: Can I use embroidery floss? Is it OK to use embroidery floss for hand quilting thread? It is easier to match thread to fabric. I have to admit that I've only completed one hand quilting project, a small log cabin style wall hanging. In it I used a glazed hand quilting thread. The glaze seemed to make it easier to pull the thread through the quilt with fewer knots and tangles. Can you use embroidery floss? Use a strand about 18 inches long. Much longer and the thread will start to shred from the constant pulling of it through your quilt sandwich. Move the needle down the thread as you stitch so that you don't wear a weak spot into the strand. 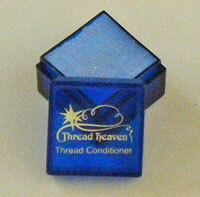 Use a thread conditioner like Thread Heaven to keep the strand from tangling as you quilt. Beeswax is another alternative, though it will leave a noticeable film on your thread. You may also find the information on taming hand quilting thread tangles to be of interest. How many strands to use? That would depend on how much you want your quilting to show. Several years ago, the 'big stitch' was popular where I live. It was a longer, bigger hand quilting stitch, done with thicker thread. If memory serves me correctly, several strands of embroidery floss was used too. Obviously you'll need a bigger needle for several strands of thread. My experience with embroidery floss is limited to using DMC for counted cross stitch designs. Every project I ever stitched was washed to remove the dirt and oils that accumulated after a year's worth of stitching. To prevent the threads from running, especially the reds, I always added vinegar to my wash water. But that was a long time ago. I know more now and my time is at even more of a premium. These days, I would first test for bleeding any embroidery thread I planned to use in a quilt. Especially if it's hand quilted. You've just got too much time involved in quilting to run the risk of a thread bleeding...and it does happen. Stitch a bit on a practice sandwich. Then wash and dry it the way you will the finished quilt. If the embroidery floss passes this test, you're good to go! Readers, if you have any experience with using embroidery floss for hand quilting, please tell us about it using the 'comment' link below. Comments for Hand quilting thread: Can I use embroidery floss? This is the best answer I have ever seen to a question. I just started quilting and love it. Boy do I need information that makes sense. Love your site. You must be a great teacher. From the Editor:I glad it helped! Thank you for writing, but you are much too kind!